With three stages to go, Utah's Tanner Putt – Bontrager Cycling Team is now placed as the 3rd best young rider and 23rd overall in the 2013 Amgen Tour of California (ATOC). Tanner's performance so far represents his tranquil and mature approach to his chosen profession. Tanner is the consummate teammate. That statement may suggest that a rider may sacrifice their own ambitions when it comes to results. Tanner has done well to balance his team support while marshaling his own ambitions. According to Tanner's brother Andrew, Tanner often pairs with fellow finisher Bontrager Cycling Team rider Jasper Stuyven (Bel). 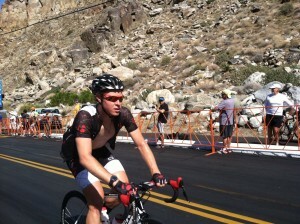 On Stage 1 Tanner's support of Jasper resulted in Tanner's 10th place finish in stage 1 of this years ATOC. On stage 2 of this years ATOC, Tanner placed 25th in a stage ending in a brutal summit-finish climb to the Aerial Tramway in Palm Springs. Much of the day's temperatures soared above 100 degrees Fahrenheit. On stage 3 Tanner placed 37th in Santa Clarita, CA. And yesterday, Stage 4, Tanner placed 17th finishing beach side in Santa Barbara, CA. The consistency of these finishes reflect the quality of a rider that Tanner has become. Today's stage 5: Santa Barbara – Avila Beach, 186km begins with a 600 meter climb over San Marcos pass before dropping into the Santa Ynez valley, home of Santa Barbara county vineyards, ranch country, and the quaint picturesque towns of Los Olivos and Solvang. The Santa Ynez Valley is often the location for winter training camps for professional cyclists and spring tours for the recreational rider where the Figuroa Mountain Road offers more than 1300 meters of climbing and the gentler grade and mild rollers of Foxen Canyon offers valley scenery. Today's stage, in all likelihood, will end in a field sprint as the usual formula of an escape by four to five riders and then a capture with less than ten kilometers to go before the finish at Avilia Beach. One complication will affect today's outcome and that is the expected block-crosswind as the peloton winds north through Santa Maria, CA to arrives at Avilia Beach. Tanner should know the roads well as the Bontrager Cycling Team based one of their training camps this last February in Buellton, CA. What will be interesting today is if Bontrager Cycling Team manager Axel Merxck again encourages his young riders to pursue their own ambitions as the Amgen Tour of California is one of the premier events international professional cycling events in the United States where young riders set the stage for their profession futures.